Timed with the release of the Nintendo 3DS, Asphalt 3D is one of those games that feels like an early launch title. 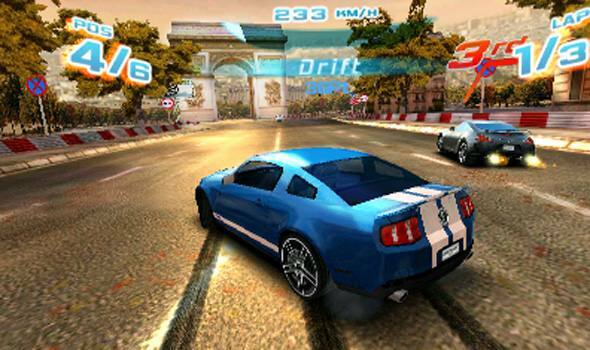 The game marks the second time that French developer Gameloft released an Asphalt title to coincide with a new Nintendo handheld device, as they did in 2004 with Asphalt Urban GT on the Nintendo DS, and frankly, the series hasn't improved much over the years. Asphalt 3D feels like a mix between the arcade racing of Burnout and the cop evasion moments of Need For Speed, while never achieving the level of excitement or tension those two games offer. What we have is a very average racer featuring 17 tracks from cities around the world such as San Franciso, Tokyo, Madrid, and Las Vegas. Each of the tracks has its own distinct flavour, ranging from the narrow and congested downtown core of Tokyo to the scenic seaside view of Saint Tropez. While the scenery is diverse, each location feels jagged, unpolished and more times than not just a little too bland. While the tracks may be dull to look at, the more than 40 licensed cars in the game look good, especially in 3D. You begin the game with only a handful of vehicles at your disposal, and as you gain experience you unlock more powerful cars such as the Mercedes C 63 AMG, Audi S5, and Ferrari 599 GTO﻿. Experience is gained by winning league challenges in the Career mode or finishing races in the Free play mode. The bread and butter of Asphalt 3D is its Career mode which spans 14 leagues each containing four main challenges and one bonus challenge. 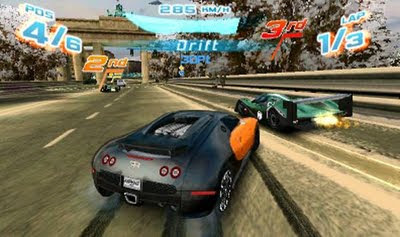 These challenges vary from traditional races, Vigilante mode which requires you to eliminate your opponents, and High Speed Chase where the objective is to outrun pursuing police vehicles. The problem is, some of the game modes are just flat out broken. Take Drift for example, the goal here is collect a certain number of drift points by drifting around corners, but it actually doesn't matter what position you place in or how long it takes you to reach your point goal. If you're close the finish line and don't have enough points you can simple U-turn, back track, and then turn back around to collect more drift points. There's another mode that requires you to collect money by smashing into cars or collecting money tokens spread along the course, but again, if you're close to finishing and are short some cash you can simply U-turn and smash vehicles until you've met the criteria. The 3D effects in the game are okay at best, but don't look quite as good as what's in Ridge Racer 3D, another arcade racing game that launched around the time of the Nintendo 3DS. In fact, unless you're a diehard Asphalt fan there's not much reason to pick up this game over Ridge Racer 3D, which has better graphics, a fantastic soundtrack and is just more fun to play. With that said, Asphalt 3D does provide a very basic level of enjoyment, just don't expect the fast-paced thrills and tension you'd expect from the better arcade racers out there, of which there are lots.